"I believe in this music." Art Blakey was one of the driving forces of hard bop, with a jazz style less melodious and with more of an edge than that of, say, Dizzie Gillespie or even early Miles Davis—it comes as no surprise, then, that Blakey was a drummer, not a horn player. Blakey is interested in busting up melody, but not in exploding it entirely; and this is still a club gig, after all, not merely an artistic exploration. 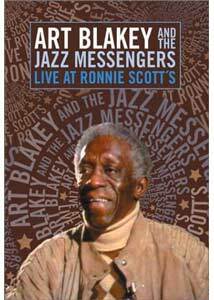 This DVD offers an hour-long set of Blakey and a quintet backing him up, at a London jazz club, recorded on February 21, 1985. It's a little sloppy and jagged, but does a good job of registering the energy and drive of Blakey's style. There are only four proper musical numbers in all, giving the musicians an opportunity to improvise and amplify on the house style. The gig opens with a mercifully brief Blakey drum solo, and then the other musicians, all of them young enough to be Blakey's sons, take turns soloing during the first song, On the Ginza. The next number, I Want to Talk About You, features especially good work from Jean Toussaint on tenor sax. Two of a Kind is downbeat, and runs a little longer; in particularly memorable form here is Lonnie Plaxico, on bass. Finally, Dr. Jackle may be the best number in the set, and the most free spirited; pianist Mulgrew Miller is the star here. The songs are intercut with very brief (less than a minute) interviews with Blakey, which seem to be included not because he has much to say, but as a way to bridge the numbers. (The audio, which is pretty fair during the music, is pretty sorry during this footage; it's frequently very difficult to puzzle out just what Blakey is saying, because he's been so poorly miked.) It's not the most stirring jazz DVD you'll see, or the best concert film, but it captures some of the propulsive energy that you can only get from a live gig. Don't forget to tip your waitresses. Image Transfer Review: This was a multi-camera shoot, but the direction seems almost arbitrary, with closeups on musicians when they're not playing, many shots out of focus, and just a raggedy, taped live quality. The video isn't of the highest quality, and looks strained and faded with the years. Audio Transfer Review: What you're here for is the music, and it sounds fair enough on either of the audio track options. The 2.0 is a little rougher around the edges; the 5.1 remix is prettier, but not as true to the mid-80s original. You can't really go wrong either way, though. Extras Review: The only extras worth mentioning are brief clips from nine other jazz titles in the MVD catalog. A good solid hour of hard driving bebop from one of the best.